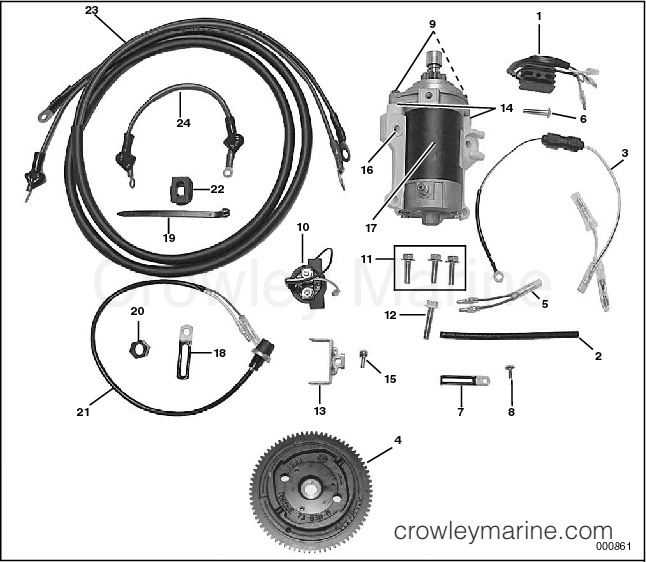 IMPORTANT: Only the parts listed here are required for correct starter assembly and installation. 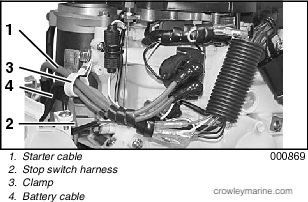 Refer to the wiring diagram in the service manual for wire routings. Remove lower pans by first removing motor cover, motor cover seal, and three screws. 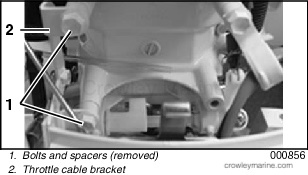 Remove rear screw. 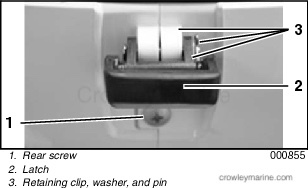 Remove retaining clip, washer, pin and latch. 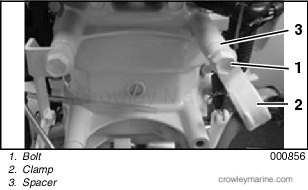 Remove both screws found inside front of motor cover pans. 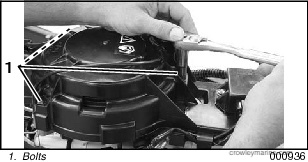 Remove port side pan and set aside to prevent damage. Remove electrical connector from CDI unit by depressing tab and gently pulling off. 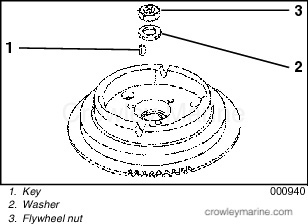 Using a flywheel holder to prevent flywheel from turning, remove nut with a socket wrench by turning counterclockwise. Remove nut and washer and set aside for later use. 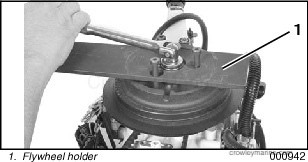 Using a suitable puller, remove flywheel and set aside. 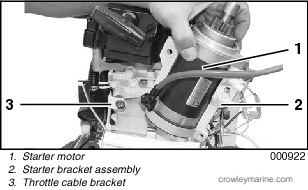 Ensure key is still in place in crankshaft and place new flywheel on crankshaft, aligning slot in flywheel with key. 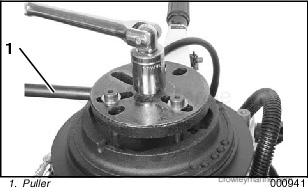 Place washer and flywheel nut on threads of crankshaft and torque to 50.5 ft. lbs. (70 Nm). Replace recoil housing and secure with four bolts previously removed. Tighten securely. 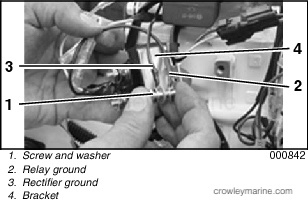 Install rectifier as shown using screw supplied. 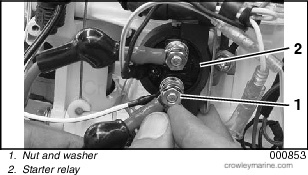 Place washer on screw and place relay ground lead terminal and rectifier ground lead terminal on screw. Insert screw through hole in bracket and start screw in threaded hole in boss on side of crankcase. 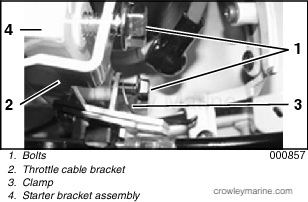 Ensure bracket is squarely seated on boss and tighten screw securely. Remove plug in front engine handle bracket. Route start switch leads through hole in bracket. 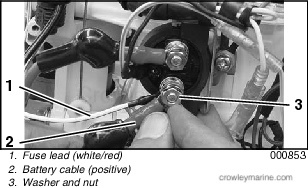 Install nut on switch leads and hand tighten. 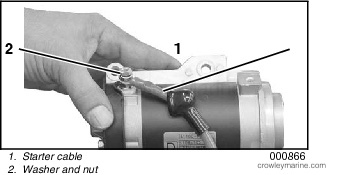 Gently tighten nut with wrench. 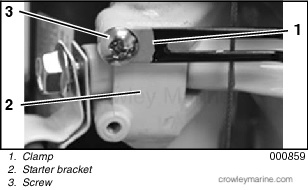 Insert leads through grommet in port side of bracket. 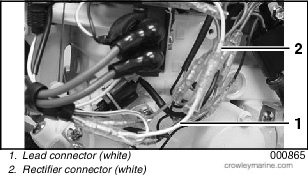 Route leads through grommet into port side of control panel. 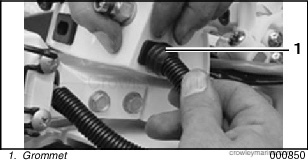 Prying grommet from panel first allows for easier installation. 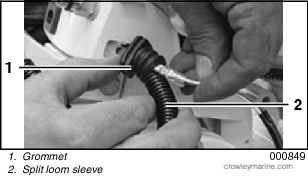 Slip wires inside of split loom sleeve. 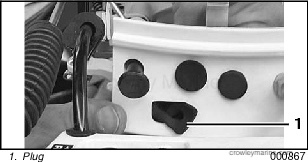 Carefully reinsert grommet into side of panel. 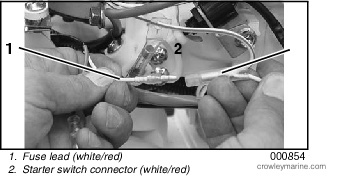 Place starter cable, washer and nut on stud, orient cable as shown and tighten nut. Remove the two bolts and spacers from throttle cable bracket and move bracket aside. Remove bolt, clamp, and spacer. Insert starter motor and starter bracket assembly in place with throttle cable bracket in front of starter bracket assembly. Use new supplied bolts to secure throttle cable bracket. 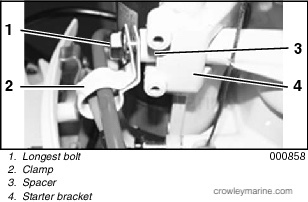 Install bolt in top hole through throttle cable bracket and starter bracket assembly and another bolt through clamp, throttle cable bracket, and then through starter bracket. Install the longest of the bolts through clamp and spacer, then through starter bracket. Install remaining bolt through starter bracket. Install the longest of the bolts through clamp and spacer, then through starter bracket. Install remaining bolt through starter bracket. IMPORTANT: Leave mounting bolts finger tight until after battery cable is routed. Secure clamp to starter bracket using screw. 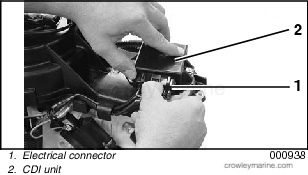 Position as shown and tighten securely. 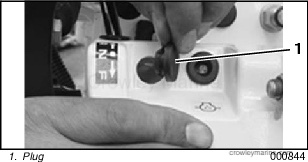 Remove rectangular plug from front of instrument panel. 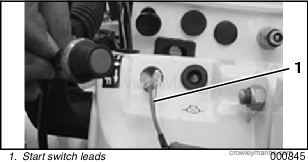 Insert rectangular grommet in hole and route battery cables through grommet. 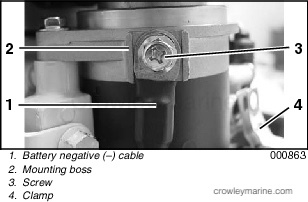 Connect battery negative (–) cable to mounting boss on top of starter with screw and tighten securely. Bend clamp over cable to secure. 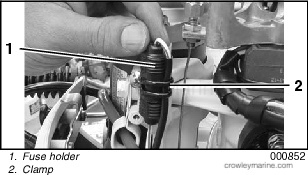 Route the starter cable and stop switch harness through the clamp along with battery cable. Torque starter mount bolts to 12 to 14 ft. lbs. 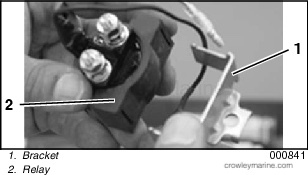 IMPORTANT: Start switch lead assembly may be too short to route through clamp but will be secured after wiring procedures are completed. 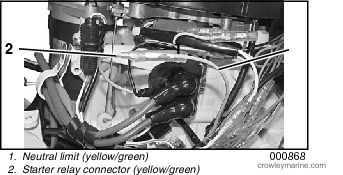 Unplug neutral limit lead (yellow/green) from connector and attach to starter relay connector (yellow/green). 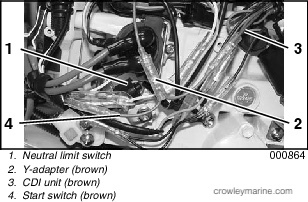 Disconnect neutral limit lead (brown) from CDI unit (brown). Connect neutral limit switch (brown) to female bullet terminal of Y-adapter (brown). Connect Yadapter terminal to CDI unit (brown). Connect the other adapter lead to start switch (brown). 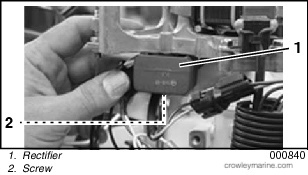 Remove nut and washer from lower stud of starter relay. Locate fuse case assembly and place white/red ring terminal lead on lower stud then attach battery cable positive lead (red) and fasten using washer and nut. Tighten securely. 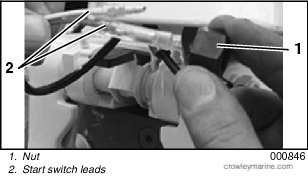 Attach fuse lead connector to white/red lead connector of starter switch. 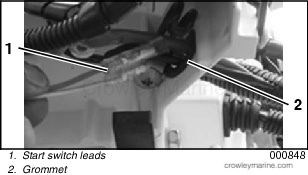 Attach white lead connector to white lead connector of rectifier assembly. 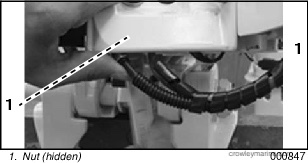 Secure fuse holder with clamp as shown. Connect stator leads to rectifier leads. Red stator lead to red rectifier lead and yellow stator lead to yellow rectifier lead. 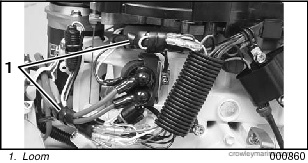 Using loom supplied in addition to loom removed from stator leads, wrap all wiring. 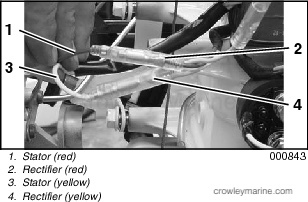 Special care must be taken to ensure all wiring is secured from contact with any moving parts. 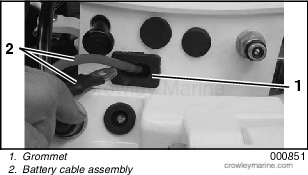 Avoid outboard damage and injury by keeping wiring away from shift lever/lockout assembly. Replace lower engine covers and reinstall spark plug leads. 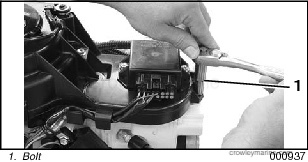 After replacing lower engine covers, run the outboard and test to ensure proper operation of electric start features such as start in-gear protection, emergency stop switch, and battery charging. 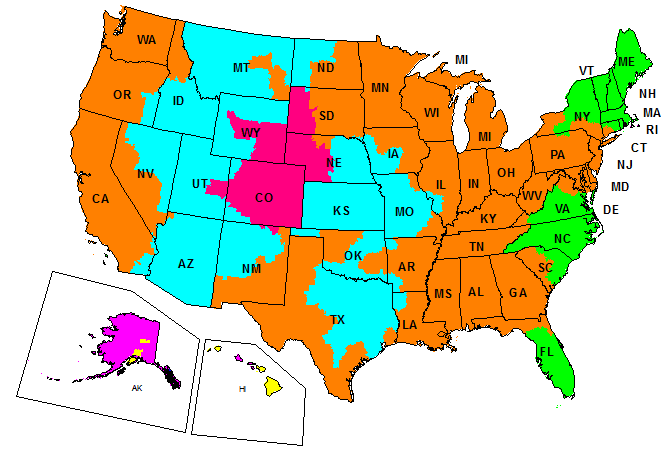 Inspect and verify correct operation of start in-gear protection. 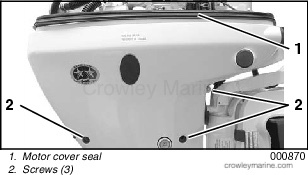 Failure to check work can lead to outboard damage or personal injury. IMPORTANT: Advise owner to refer to the Operator’s Guide for electric start operating instructions.